The reconvened APPG on ME had been expected to hold a planning meeting in September. I cannot confirm whether and when a planning meeting took place. Today, I have written to David Amess MP (Acting Chair, APPG on ME), Annette Brooke MP (Vice-Chair, APPG on ME), APPG on ME ME Association Secretariat and Jane Colby (The Young ME Sufferers Trust). I have requested that the controversial issue of the Bath/Bristol Lightning Process pilot study in children (which for which ethics approval was obtained in September and for which the study protocol and related documents were published on 16 September) is going to be tabled for discussion at the first meeting of the APPG on ME, on whatever date this takes place. If this is not being tabled for discusion I have requested that it be added to the Agenda. The following have been advised: Invest in ME; 25% ME Group; RiME, Sue Waddle (rep for ME Research UK) and BRAME. I took the opportunity of thanking Annette Brooke, again, for raising this issue with Rt Hon Andrew Lansley, MP, Secretary of State for Health and also for tabling the Parliamentary Question for which a response was received from Paul Burstow, MP, Minister of State (Care Services), on 11 October. I also thanked the ME Association and The Young ME Sufferers Trust for their very strong opposition statements, their joint press release and for their representations to the Department of Health and to the Chair of South West 2 Research Ethics Committee. I will confirm whether this issue is being tabled for discussion at the next meeting of the APPG on ME, which is expected to be held in November but for which a date has yet to be confirmed. An EDM (Early Day Motion) has been tabled by Ian Swales MP (LibDem Redcar). It is understood that this results out of lobbying by Jan Laverick and a family member. That this House notes that despite the fact that the Department of Health now accepts myalgic encephalomyelitis (ME) as a genuine medical condition, diagnosis can still pose a problem because ME symptoms are similar to those present in a number of other medical conditions; recognises that one of the main obstacles to the adequate treatment of ME is the lack of knowledge and consensus about the disease; believes that funding and research must be focused on the bio-medical factors involved and not just simply managing the psychological symptoms; requests that the Government establishes an independent scientific committee to oversee ME research; and calls on the Government and the Medical Research Council to work with ME sufferers and bio-medical researchers in order to achieve a proper understanding of the condition’s challenges and unjust perceptions of the condition. Read debates they’ve taken part in, see how they voted, sign up for an email alert, and more. Chris Grayling (Minister of State for Employment): All health care professionals working for Atos Healthcare are required to read an evidence based protocol on chronic fatigue syndrome as part of their induction training. This was last updated in January 2010. In addition, all health care professionals are required to engage in a programme of continuing medical education which includes two modules on chronic fatigue syndrome. These were last updated in April 2009 and March 2010 respectively. In August 2010, Invest in ME (IiME) published a document titled: ‘A New Era in ME/CFS Research: An Opportunity for Major Progress in Diagnosis, Treatment and Research into Myalgic Encephalomyelitis’¹. The scope of a proposal has direct bearing on project objectives and methodology and provides a framework within which the project can be assessed. In the current proposal, it is unclear whether the Centre is aimed at servicing the Norfolk region only or the UK as a whole (which, presumably, would include Scotland and Northern Ireland). For example, there is reference to a “national centre of excellence for ME” whilst also discussing East Anglia as being a ‘region of opportunity’. In particular, it is unclear whether there is a distinction in national and regional service provision between the separate clinical and research facilities detailed in the proposal (and located in Norfolk and Norwich University Hospitals, and the University of East Anglia/Norwich Research Park respectively). If the clinical service is intended to be national, the following questions arise. • Why has Norwich been selected as a location (given that it has poor logistical accessibility for the rest of the country)? • Have other geographic locations and facilities been considered? • If so, how has their suitability been assessed and by whom? For both a national and regional remit, the following questions arise for the clinical service. • Why have Norfolk and Norwich University Hospitals (N&NUH) been selected to host the Centre’s clinical facility? • What specific types and levels of expertise would N&NUH bring to the Centre? • Does N&NUH health care staff have the capabilities and infrastructure to deliver the proposed service and, if not, how would this be addressed? • Have other facilities been considered? For a national and/or regional remit, the following questions arise for the research service. 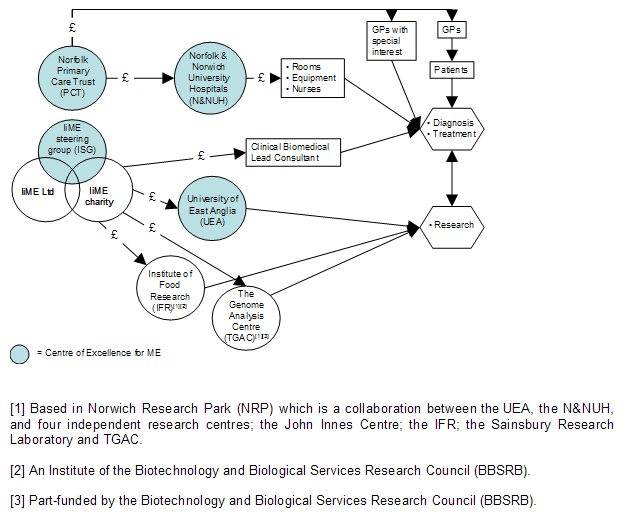 • What is the rationale for selecting the University of East Anglia/Norwich Research Park (UEA/NRP) to run the Centre’s research programme? • Has the UEA/NRP submitted a formal proposal for hosting the research programme? • If so, who has assessed this and how has it been assessed? • Have other research facilities been asked to submit proposals? • If so, who has assessed these and how have they been assessed? The distinction between a national and regional service is further confused by the assumption that the Centre’s ‘translational’ model can be achieved only where the clinical and research services share the same geographic location. The rationale for this assumption is unclear and, indeed, is contrary to the existing health care provision framework in the UK which operates through a countrywide network of medical facilities within (or co-ordinated by) the National Health Service (NHS). The document uses the nomenclature ‘ME’ (myalgic encephalomyelitis) to describe the condition that it intends to cover although there are further associated illnesses that overlap with ME and, indeed, may actually be the same disease (e.g. fibromyalgia, atypical MS, atypical lupus). In addition, the UK medical profession uses other terms to describe ME, including Post Viral Fatigue Syndrome (PVFS), Chronic Fatigue Syndrome (CFS) and even just chronic fatigue. The UK medical profession also lacks clarity and consistency in disease definition and diagnosis, an issue which, as pointed out in the proposal, can lead to patients being diagnosed incorrectly (either as having ME when they do not or not having ME when they do). To avoid the considerable confusion and inaccuracy of existing nomenclature, definition and diagnosis, it may be preferable to adopt the term ‘neuroimmune disease’, as used by the US Whittemore Peterson Institute (WPI) which the proposal states is a role model for the Centre. This may also avoid the potential confusion between the Centre of Excellence and existing NHS ME/CFS Centres (referred to in the proposal) which attract criticism for, amongst other things, their lack of biomedical intervention and focus on occupational and behavioural therapies. In addition, this would provide a platform for further research into the human gammaretrovirus (HGRV) family which has been linked with ME and is the current focus of the WPI. The current proposal does not make reference to this retrovirus and this would seem an oversight given (a) the growing scientific interest in this area and (b) that donors to IiME’s Biomedical Research Fund approved support of the WPI’s UK study of HGRVs. It is also highly relevant for diagnostic purposes (a key focus of the proposal) given the likelihood that HGRVs will become, at very least, a biomarker for ME. Successful projects are underpinned by objectives which are specific, quantified, achievable and measurable. The current proposal omits specific, quantified objectives or project ‘deliverables’, possibly because these are difficult to define given the lack of a precise scope. Once the scope has been clarified, it may help to establish an overarching mission, a set of objectives and a timeline for implementation. Given that this is a start-up project with a limited budget (see 4. Funding), it may be prudent to begin with a limited remit that can be met within a short lead-time and then used as a basis from which to develop more ambitious plans. quantified top line objective (e.g. diagnosis and treatment of a specified number of housebound patients pa). All objectives would require an accompanying plan for delivery and methods of measurement and assessment. In the absence of specific and robust objectives to use as a benchmark, it is difficult to assess the potential outcome efficacy of the proposed service model although questions about operational efficiency can be raised at this stage. The diagram in figure 1 is a graphic representation of the service provision model described in the proposal. The shaded organisations are those which, combined, form the Centre of Excellence. The proposal describes this as a “simple but effective structure”, although it could be argued that the model is, actually, quite complex given the number of stakeholders and communication pathways that are involved. In addition, four separate organisations and geographic locations constitute the Centre of Excellence itself, which makes it a concept rather than a single entity, and so conflicts with the proposal’s underlying theme of a closely integrated operation. The responsibilities of each of the organisations within the Centre are unclear from the proposal, as are how they will inter-relate and how communication and control will be managed. In particular, the proposal requires more detailed explanation of the roles of Norfolk PCT and N&NUH, not only in terms of how they may provide patient services regionally and/or nationally, but also in terms of their potential model for other PCTs and hospital trusts to follow, as well as their operation within the NICE (National Institute for Health and Clinical Excellence) guidelines for treating ME. The proposal states that “a new commissioning director at Norfolk PCT…is supporting the steering group’s views”. It would be helpful to name the individual in question and also include their input in detail. The position of a ‘clinical biomedical lead consultant’ is mentioned and also that candidates have been approached for this role, although their remit and responsibilities, selection and measurement criteria, and reporting structure are not explained. Similarly, it is unclear how the ‘GPs with special interest’ who support the lead consultant will be identified, enrolled, trained and funded. The proposal recognises the critical importance of training health care staff (and also mentions ‘visiting experts’) although it is unclear who will be responsible for training the N&NUH staff, which staff will be trained and how training will be implemented and monitored. Staff training will be paramount to the Centre’s success, particularly given the NHS’ current dearth of biomedical knowledge about ME and its inappropriate and, sometimes, harmful treatment options for the disease (as per the NICE guidelines, mentioned above). IiME needs to demonstrate that the NHS’ long established and entrenched misunderstanding of ME can be corrected, and swiftly, if the Centre is to gain the confidence of patients and commitment of financial donors. With specific reference to IiME’s involvement in the project, the proposal would benefit from more detailed explanation of the following. In addition, it would be helpful to understand how the Centre’s work might be integrated with that of other ME research organisations such as ME Research UK (currently funding a HGRV study in Sweden), the UK CFS Research Foundation (supporter of Dr Jonathon Kerr’s research for many years), as well as with its stated role model, the US WPI. The proposal omits a top line funding requirement, a budget break-down and a cost-benefit analysis for the project. This amount seems low in the context of the proposed service provision model and particularly in comparison to the Center for Molecular Medicine (home of the WPI at the University of Nevada) which cost $77 million to establish. The proposal states that funding for research would be “organised and provided by the charity and the UEA” although there is no further detail of how this would be supported nor who would fund the clinical element. As a consequence, the following information remains to be confirmed. • The estimated cost (overall and breakdown) of establishing and maintaining the Centre over a given time period (for example, five years). • The share and source of funding to be provided by each of the organisations involved in the Centre. • How the funds will be raised by each of the contributing organisations. • Methods for monitoring expenditure, measuring outcomes and reporting to fund contributors. • For those funds raised via IiME (the charity), whether donors will contribute to the Centre as a whole or to specific research and/or clinical projects. – donations to a separate Centre specific fund. • Whether, after completion of the WPI’s UK study, any residual monies in IiME’s Biomedical Research Fund will be transferred to the Centre or remain in the Fund for further research projects, and whether donors’ approval will be sought for either course of action (as per the precedent set when monies were reallocated from Dr Kerr’s withdrawn research to the WPI’s UK study). Fund donors may wish to see further explanation for, and clarification of, the following potential conflicts of interest. • Dr Ian Gibson’s involvement in this project will raise concerns with those who did not welcome his unofficial ‘Gibson Inquiry’ into ME (as referenced in the proposal) and the subsequent uncorrected ‘e-report’ which was published in October 2006³. There were significant criticisms of the way that Dr Gibson and his panel undertook this inquiry (which was a personal project and not a formal Parliamentary Inquiry or Report), such as the involvement of Lord Turnberg, a known supporter of cognitive behavioural therapy (CBT) and graded exercise therapy (GET), and the absence of proper consultation with the inquiry’s constituency of interest at all stages throughout the life of the project. Previously a Labour backbencher, Dr Gibson was barred from standing for the party in the 2010 general election following questions about his ministerial expenses. • Dr Fiona Poland of UEA’s Institute of Health and Social Science Research is working in partnership with Action for ME (AfME) and a network of universities on part of a major ME research project sponsored by the Big Lottery Fund (i.e. reporting and developing early findings on the impact of the illness and available means of support). The association between UEA and AfME will raise concerns with a growing number of patients who openly criticise the latter’s role, agenda and efficacy, particularly in terms of its apparent unwillingness to support biomedical ME research and to challenge the psychosocial paradigm. • The Norwich Research Park is a joint venture between the UEA, and amongst others, the Sainsbury Laboratory which, in turn, is supported by the UEA and the Gatsby Foundation. The Gatsby Foundation is one of a number of Sainsbury Family Charitable Trusts which share the same administrators and counsels. This includes the Linbury and Ashden Trusts which have provided funding for the RNHRD NHS FT, Bath (the ‘Min’) and the University of Bristol’s controversial trial of the Lightning Process on children and for which IiME has stated its public opposition. and Skills (BIS). This is a complex organisational structure which makes it difficult to achieve transparency in funding governance and also to identify potential conflicts of interest. • It is unclear from the proposal whether ME support groups in the Norfolk region (or nationally, if the scope is such) are involved in this project and the degree to which they have provided input and support. It is also unclear whether there has been any wide-scale patient consultation for this project or if any is planned in the future. Chris Douglas is an ME sufferer and ex-corporate project manager. At the 5th Invest in ME International ME/CFS Conference held in May, this year, a proposal was announced for the establishing of a “Centre of Excellence for ME” in Norfolk. To the best of my knowledge, Invest in ME had undertaken no national consultation with ME patients before drawing up its proposals. Today I am publishing a review of Invest in ME’s proposal prepared by Chris Douglas. A text version of this review is published in the next post. Invest in ME is constituted as a Trust, registered with the Charity Commission and run by a committee of three Trustees/Directors. Invest in ME is not a membership organisation. The organisation was founded in 2006 by carers and patients, Sue Waddle, Richard Simpson and Kathleen McCall (current chair). Ms Waddle has since stood down as a Trustee. “…The independent charity will carry out the official campaigning for funding for the centre once a formal agreement is made. “Now the charity has offered to send some of the UEA researchers to a biomedical research symposium in Australia at the end of the year. “Mr Simpson said: “This would involve them discussing work with the top ME researchers and clinicians in this field from around the world. Today, the 25% ME Group has issued a position statement on the Dr Esther Crawley led RNHRD NHS FT Bath / University of Bristol proposed pilot study into the feasibility of recruiting to a randomised controlled trial (RCT)comparing the Lightning Process with specialist medical care. The Medical Advisors to the 25% ME Group are Dr Byron Hyde (Canada) and former UK NHS paediatrician, Dr Nigel Speight. Whilst I welcome the issuing of this statement, it should be noted that the press release announcing the pilot study was issued over five and a half months ago. According to information provided by University of Bristol Information Rights Officer and their Director of Legal Sevices, information on the study and the research protocol is anticipated to be published on the University of Bristol website by the end of this month. This suggests that ethics approval for the pilot study may now have been obtained. It is not known whether the 25% ME Group has or intends to make representations to any individual, institutions, organisations or bodies. On 4 August, the ME Association released a list of recipients of the press release issued earlier that day jointly with the Young ME Sufferers Trust. The list is media recipients is appended beneath the press release. ME agenda welcomes this very strong opposition statement from the ME Association and The Young ME Sufferers Trust. The iniative to liaise with Trading Standards is also welcomed. My own position is that to undertake RCTs on any patient group would be giving credence to the Lightning Process as having potential as a treatment for ME and would also legitimise it, ethically, as a potential treatment. I would not want to see any RCTs into the application of the Lightning Process, whether undertaken with ME patients, MS patients or for any other medical disease, condition or syndrome. The pilot study, scheduled to start in September, will look at the feasibility of recruiting children aged eight to 18 with ME/CFS into a randomised controlled trial (RCT) comparing the Lightning Process with specialist medical care. It is planned that over 90 children aged between eight and eighteen and their families will be involved in the study. The Medical Research Council (MRC) produces specific guidelines for research involving vulnerable patient groups. Tom Moore, health editor, Sky News, and his news desk. Stacey Poole, the ME-aware health editor at Meridian, ITV station for south of England. Emailed Times Ed Supplement, highlighting educational aspects of the release and suggesting they speak with Jane Colby. Invest in ME has issued a statement around its decision to decline an invitation to become a member of BACME (British Association for Chronic Fatigue Syndrome/Myalgic Encephalomyelitis). For Invest in ME’s position statement on the proposed Bath/Bristol pilot study to investigate how to recruit to a randomised controlled trial looking at the Phil Parker Lightning Process and specialist medical care in CFS/ME in children as young as eight, go here Invest in ME March 2010 Newsletter. Invest in ME recently received an invitation from the British Association for Chronic Fatigue Syndrome/ Myalgic Encephalomyelitis (BACME) inviting us to apply to become an executive member of that organisation. BACME is chaired by consultant paediatrician Dr Esther Crawley – who was recently awarded a grant to do a clinical trial on the Lightning process (funded with £164,000 from the Linbury Trust and the Ashden Trust) – a business which assumes that no matter what is causing an ME patient’s illness it will help cure a patient from them. “…. It does not matter how it started. Sometimes people had a bacterial infection, sometimes people had a viral infection. It does not matter how it started. The Lightning Process works equally well”. Such uninformed, non-clinical and dangerous statements being used by people promoting businesses without any medical training, at a time when the need for more funding for biomedical research into ME and the evidence to support that funding requirement is overwhelming, is symptomatic of the problems on a non-strategic, non-biomedical approach to diagnosing and treating people with ME. Meanwhile ME patients and their families have to witness this absurd waste of money. Dr. Crawley’s views on ME aren’t those of Invest in ME’s and we have serious concerns about her position as chair of an organisation such as this. The Assistant Chair of BACME is Alison Wearden, who is Reader in Psychology at the University of Manchester, Chair Elect of British Psychological Society’s Division of Health Psychology and Associate Editor of British Journal of Health Psychology and whose studies include “Illness cognitions and diabetes – how the beliefs which patients hold about their diabetes impact on their attempts to manage it, their adjustment and well-being”. Wearden was head of the FINE trials (click here) – a waste of taxpayers’ money which resulted in nothing of value for people with ME. Invest in ME rejected the NICE Guidelines and therefore cannot agree to endorse a constitution which lists among other things the above objectives. “So, it can be concluded that the efficacy claim for CBT/GET is false. But what is more important, is the fact that numerous studies support the thesis that exertion, and thus GET, can physically harm the majority of the ME/CFS patients. The NICE guidelines need complete revision* as their current version is far from evidence-based. The NICE guidelines have been shown to be ineffectual, biased, unusable, with ME patients eventually taking NICE to a judicial review. For an organisation to support NICE, and require members to abide by them, let alone “champion” them illustrates a flawed and damaging basis for any claim to represent people with ME and their families. Such an organisation is likely to continue to force a continuing approach of going round in circles, obfuscating the true requirements for ME patients and achieving little of real value for people with ME and their families. With BACME maintaining its present structure, current chairman and constitution then Invest in ME will decline any offer to apply for membership of this organisation. It would be unethical of Invest in ME to sign up to such a constitution and Invest in ME’s aim remains to find ways other than those set out in the NICE guidelines to treat patients diagnosed with ME according to the Canadian Clinical Consensus guidelines. Is it ethical to undertake a pilot looking at feasibility of recruiting children 8 to 18 with CFS and ME into an RCT comparing Lightning Process and specialist medical care when no rigorous RCTs into the application of LP in adults have been undertaken? Thank you to everyone who registered their opinion. Poll: Is it ethical to undertake a pilot study looking at the feasibility of recruiting children aged 8 to 18 with CFS and ME into a randomised controlled trial (RCT) comparing the Lightning Process and specialist medical care when no rigorous RCTs into the application of the Lightning Process in adults with CFS and ME have been undertaken? Poll: Do you think it is ethical to undertake a pilot study looking at the feasibility of recruiting children aged 8 to 18 with CFS and ME into a randomised controlled trial (RCT) comparing Lightning Process and specialist medical care when no rigorous RCTs into the application of LP in adults have been undertaken? An internet sponsored link stated “Chronic Fatigue Recovery. End the cycle of ME/CFS: Get Well! with The Lightning Process”. The complainant challenged whether the claim “Chronic Fatigue Recovery. End the cycle of ME/CFS” could be substantiated. Withinspiration said they had personal experiences of improvement in medical conditions, such as myalgic encephalomyelitis (M.E), as a result of using the lightning process. They argued that the lightning process, created by Phil Parker, had received a number of celebrity endorsements and positive press articles, which they believed were a testament to the effectiveness of the treatment. Although Withinspiration said they held no scientific evidence to support the claims, they said that trials were due to commence in 2010. The ASA understood that the lightning process was a three-day course that sought to teach individuals a range of techniques, such as life coaching and neuro-linguistic programming skills, to improve physical and mental well being, particularly amongst those with chronic fatigue syndrome (CFS) or ME. We were concerned that Withinspiration did not hold robust evidence to support their claims that the lightning process was an effective treatment for CFS or ME. We therefore reminded them of their obligations under the CAP Code to hold appropriate evidence to substantiate claims prior to publication. Because we had not seen any evidence to demonstrate the efficacy of the lightning process for treating the advertised conditions, we concluded that the claims had not been proven and were therefore misleading. The ad breached CAP Code clauses 3.1 (Substantiation), and 50.1 (Health and beauty products and therapies). “Breaking News – NHS and Lightning Process research collaboration. This statement no longer appears on his website. It is unclear whether Mr Gibson retains an involvement with this proposed pilot study. On 2 March, the Royal National Hospital for Rheumatic Diseases NHS Foundation Trust, also known as the Min, and the University of Bristol announced a research study looking into “interventions and treatment options for Chronic Fatigue Syndrome” . Funding of £164,000 from the Linbury Trust and the Ashden Trust has been awarded to the research team led by Dr Esther Crawley, Consultant Paediatrician, Royal National Hospital for Rheumatic Diseases, Bath, the CFS Clinical Lead for Bath NHSFT and a Senior Lecturer, University of Bristol. Dr Crawley, FRCPCH, PhD, is a Senior Lecturer at the University of Bristol, a Consultant Paediatrician and clinical lead for the Bath CFS service. Dr Crawley’s specialist CFS service for children and adolescents is reported to be the largest regional paediatric service in the UK and also provides services nationally. Dr Crawley had been a member of the NICE CFS/ME Guideline Development Group and gives presentations around the NICE guideline CG53 and the CFS/ME Clinical and Research Network. Dr Crawley had chaired the CFS/ME Clinical Research Network Collaborative (CCRNC), now reformed under the new name “BACME”, for which Dr Crawley continues as chair. Dr Crawley is a member of the MRC’s “CFS/ME Expert Panel”. In the last couple of years, Dr Crawley’s research team has been awarded considerable sums of funding for CFS studies and Chronic Fatigue studies in children – including a £873,579 NIHR Clinician Scientist Fellowship award, last year. She has also received funding from patient organisation, Action for M.E. (£49,650). The Lightning Process is controversial and untrialled. It is marketed by the Phil Parker organisation not as a therapy or a treatment but as a “training program” delivered by “instructors” or “practitioners” or “coaches”. Instructors are trained and licensed by the Phil Parker organisation and are not accountable to any regulatory professional body. If individuals have complaints about a practitioner or about the Lightning Process, itself, which cannot be resolved directly with the practitioner or through the Phil Parker complaints procedure, their only recourse is Trading Standards. Some practitioners may already be established therapists in CAM or psychotherapy fields but have trained with the Phil Parker organisation to also offer the Lightning Process to their clients. But many Lightning Process practitioners are individuals who have undergone the process for some condition or other, then paid to train with the Phil Parker organisation to become “Licensed Lightning Process Practitioners”, themselves, and will have had no previous background in therapies or life coaching. In March 2007, Action for M.E. published an article featuring several negative patient experiences of undergoing the Lightning Process . Data from two large patient surveys carried out by Action for M.E./AYME (published 2008) and by the ME Association (published May 2010) show similar levels of worsening of symptoms in CFS and ME patients following the three day “training program”, or of no improvement at all (AfME/AYME: Worse:16%, No change: 31%; MEA: Slightly worse 7.9%; Much worse 12.9%: No change: 34.7%) . At the July 2009 meeting of the Countess of Mar’s Forward-ME group, patient reps discussed their concerns that Phil Parker was being given a platform at a University College London workshop, held in conjunction with Great Ormond Street Hospital (GOSH), for medical and allied health professionals working with children and young people with ME and CFS at which Mr Parker would be promoting the Lightning Process . CFS clinical lead and paediatrician, Dr Esther Crawley, who was presenting at this Forward-ME group meeting, was invited to participate in discussions around the GOSH workshop, the Lightning Process in general and its application in children, in particular. According to the minutes of the July meeting, Mary Jane Willows, CEO AYME, was tasked with approaching the workshop organisers to discuss ME patient organisation concerns. The outcome of this initiative was not recorded in the minutes of the next meeting of the Forward-ME group. To date, no rigorous, randomised controlled trials into the safety, acceptability, short and long-term effects of the Lightning Process have been carried out in adults with ME and CFS. There is no reliable, independent published data on the safety of the application of the Lightning Process. Patients and carers were astounded to learn, in early March, that a Bristol/Bath research team led by an NHS consultant paediatrician intends to undertake a pilot study to investigate whether it is possible to recruit children as young as eight with CFS and ME into an RCT comparing the Lightning Process with specialist medical care. The study has the involvement of Phil Parker and is expected to start in September 2010. Not only is it feasible to carry out research into the application of the Lightning Process using adults with ME and CFS, many feel it is unethical not to do so first. There are considerable concerns that an NHS paediatric CFS unit should be planning a study involving children as young as eight when no rigorous, RCTs have first been undertaken into the safety, acceptability, long and short-term effects of the application of this very controversial “process”. It is proving very difficult to obtain any information about the design, methods and objectives of this research study. In response to a request for information under the Freedom of Information Act (fulfilled 17 June), the University of Bristol Information Office is withholding the names of Lightning Process practitioners who have an involvement with the study under Clause 22(1)(a). They are also withholding the names of the ethics committee(s) reviewing the application for ethics approval. University of Bristol has confirmed that the study (for which the funding was secured last November) is still going through the ethics approval procedure. All other information and documents requested is currently being denied . “This information is intended for future publication when the study protocol and other related documents are published online. It is therefore exempt from disclosure under section 22(1)(a) of the Freedom of Information Act. But it is a matter of considerable public interest that an NHS Trust seeks to use children as young as eight as guinea pigs. I am intending to request an internal review of the decision not to make available any information about the design and methods for this study, at this stage. What does the Lightning Process involve? The Lightning Process website describes the process as being derived from neuro linguistic programming (NLP), osteopathy and life-coaching . “I had an acute onset and went from a hardworking person to bedbound overnight. In a desperate attempt to recover I decided to try LP after reading stories of severely affected M.E. patients who had recovered. It all sounded so convincing and after a phone consultation with a LP coach I felt very positive I was doing the right thing. I borrowed the money from my parents, £880.00 as I had long lost my job, and went for it. There were 3 other m.e. patients at the same course none of these people nor myself recovered. The course was over 3 days from 10am-2pm with a break at lunchtime for tea and biscuits. We were told not to discuss the content of the course with each other during the breaks. We learned the ‘affirmation’ and stood on the floor on paper circles with key words written on them. ASK YOURSELF – WHAT DO I WANT? ASK YOURSELF- HOW WILL I GET THIS? AND DOING THE LIGHTNING PROCESS. Potential applicants for Lightning Process sessions must first complete an application form where they agree to undertake certain commitments and to sign up to certain beliefs, including that they are “ready” to benefit from the programme . Practitioners may further “assess”, via a telephone interview, an applicant’s “readiness” to participate and benefit from the “process” but also “assess” whether the applicant has any previous or current medical or psychological conditions which would render them “unsuitable” for undertaking the “process”. Practitioners are not medically qualified. Parents are expected to sign up to these beliefs and commitments on behalf of applicants under the age of 18, irrespective of whether the child or young person might be considered competent to understand the expectations of the practitioners delivering the courses or of understanding the implications of the “belief system” they are being asked to commit to and the tasks they will be expected to follow over the course of the three days of sessions and following completion of the sessions, which also includes a workbook through which affirmations are reinforced. Lightning Process practitioners are charging from £560 to £880 for three sessions which may last 3 to 5 hours per day, held on three consecutive days, and usually in a group setting. “Trainees” have reported that they are encouraged to ignore their symptoms of malaise and discomfort and at the end of the day’s session to undertake an activity which they would not normally undertake. So “trainees” are expected to agree that they are “ready” to undertake and to benefit from the program when they sign up to it; that they will commit to understanding and carrying out the instructions properly and that they will work hard at putting the “process” into practice in order that they can “live the life they love”. Is the burden of “failure” then placed on the patient and not on the ability of the “process”, itself, to “cure”, “resolve” or “substantially improve” whatever medical condition, psychological condition or “life-style issue” the process has been purchased for because the individual was not after all “ready” to undergo the “process”; or that they had not properly understood what was expected of them during the sessions; or that they had failed to carry out the instructions properly or that they had not worked had enough at putting the “process” into practice? Here’s another account by a CFS patient who also reports on the experience of a “trainee” with Multiple Sclerosis and more accounts here . There are considerable concerns for the physiological and psychological impact of exposing young children and teenagers with CFS and ME to this type of program and some of these issues are raised within my FOI request, in questions 23 thru 26 a) to l). No responses were provided to any of these questions. With no data from research into adults, how can the research team determine that overall the likely benefits of the research outweigh any risks to child participants or that undergoing the training program would not be detrimental to a child’s current health status and psychological well-being, as a patient diagnosed with CFS or ME? • the program may be physiologically and psychologically damaging to the child and may impact negatively on the family dynamics if a child were unable to complete the program and withdrew early from the study, or if the child failed to gain benefit from the program, or experienced exacerbation of symptoms during or following the program, or were to experience significant set-back or relapse or if an apparent improvement or resolution of symptoms and disability proved to be short-lived. With no data from RCTs on the safety and acceptability of the Lightning Process in adults with ME and CFS, how are parents able to give informed consent for their children to participate? The University of Bristol would provide no rationale for undertaking a pilot study in children when rigorous, randomised controlled trials (RCTs)trials have yet to be undertaken and results published on the application of the Lightning Process in adults with CFS or ME. There are also concerns that this pilot study in children might serve to legitimise referrals outside the NHS and influence potential future commissioning of the Lightning Process within NHS Trusts. There is evidence that some medical specialities are already referring patients to Lightning Process practitioners, for example, for chronic pain and for CFS, despite no rigorous RCTs having been undertaken into its safety and long-term effects and despite there being no regulatory professional body to protect these patients when accessing private sector providers. As a clinician, Dr Crawley sees children and young people with a wide range of fatigue – from fatigue relating to other conditions, for example, following head injury, to chronic fatigue, Chronic Fatigue Syndrome and severe ME, where children may be bedbound  . Because information is being withheld, it has not been possible to establish which research criteria are to be used. There are concerns that if improvement were shown in those mildly affected with fatigue that the process might be applied inappropriately to children with moderate to severe CFS and ME. What else is the Lightning Process being used for? Some Lightning Process practitioners are claiming success with patients with other diseases and conditions, like Multiple Sclerosis (MS), diabetes and some neurological diseases. What does the Lightning Process work for ? Funding for the pilot had been secured by November, last year. £44,000 over three years (09/10, 10/11, 11/12) has been awarded by the Ashden Trust; £120,000 by the Linbury Trust. An ethics committee decision is anticipated in August/September. The study is due to start in September. *AYME (Association of Young People with ME) has published no position statement, but in an article in the May 2010 edition of “LINK”, AYME describes the pilot as “an interesting piece of research”. *Dr Esther Crawley is a Medical Consultant to AYME. “Action for M.E. sees no reason to oppose this pilot study. As was made clear when it was announced, the research at this stage is simply a pilot designed to see if it would be possible to set up a trial that can independently assess the Lightning process against specialised medical care. *Sir Peter Spencer, CEO of Bristol based, Action for M.E., is a non-executive director of the Royal National Hospital for Rheumatic Diseases, Bath – Dr Esther Crawley’s employer. LP: the light at the end of the tunnel or just another flash in the pan? This is a summary of key points to emerge from two meetings of The ME Association Board of Trustees. These meetings took place at our Head Office in Buckingham on Monday afternoon, June 14th and on Tuesday morning, June 15th 2010. This is a summary of the Board meetings – not the official minutes. ED updated trustees on the current financial situation. This was followed by a discussion on the monthly management accounts for the period up to the end of April 2010. There has been a drop in some areas of income during the past few months when compared to the same period in 2009 – unrestricted donations and bank interest in particular. As a result, general expenditure is currently running slightly ahead of unrestricted income. However, income from fundraising has shown a significant and welcome increase over the same period in 2009 and in order to cope with the increased demand on fundraising support services it was decided to create a new part-time post to deal with fundraising administration with immediate effect. Details about this new post will be placed on the MEA website when trustees have agreed the job description. There has also been a significant increase over the past twelve months in the ring fenced funding held by the Ramsay Research Fund for research purposes. Trustees once again reviewed the current ‘best buys’ for interest-gaining options in relation to money kept in the business and Ramsay Research Fund deposit accounts. The new computer equipment for Head Office staff is now fully installed and working in a satisfactory manner. GB reported that a few minor problems have still to be resolved. Trustees discussed some possible changes to The MEA Memorandum and Articles of Association to take account of expected new charity legislation. Trustees passed on best wishes to Lucy Kingham, at Head Office, who will be taking maternity leave in October.